It’s still toasty hot here – another 30 degree C day in Victoria. I think it’s going to finally let up this weekend, which doesn’t sound too bad to me! 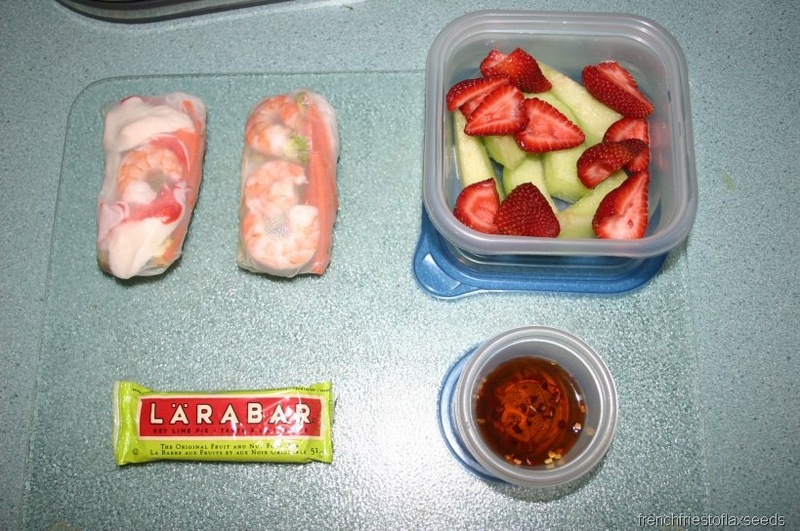 I’d say my breakfast and lunch were pretty appropriate for a hot day – who wants to cook when it’s warm out? I mean really. I had a GIANT bowl of cereal for breakfast. I’m still working on eating up the random boxes in my cupboard. 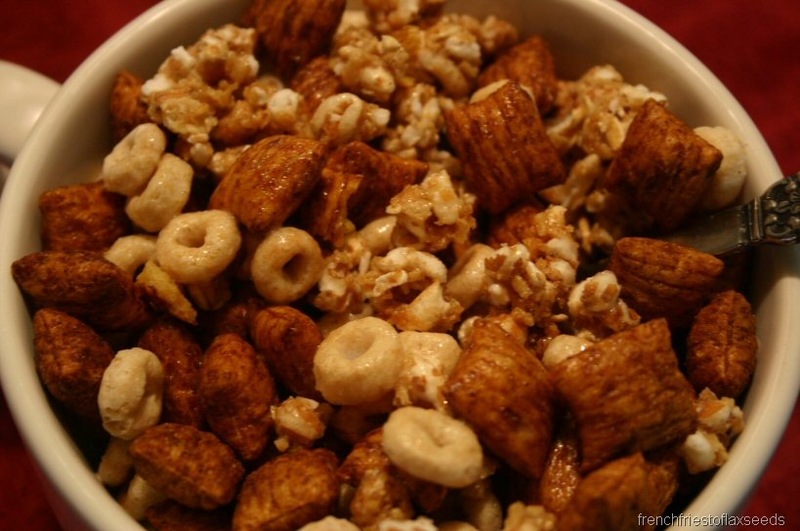 Here we have a mix of Kashi GoLean Crunch, Cinnamon Puffins, and Honey Nut Cheerios. 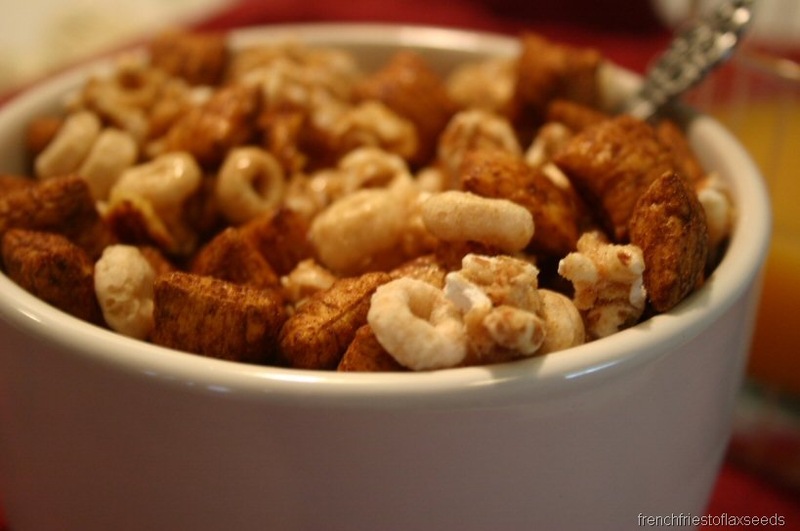 Trust me, this was one full bowl – check out the side view. And of course, there was a glass of Happy Planet Mango Peach Party. I’m loving the red background! It makes everything look very luxe. 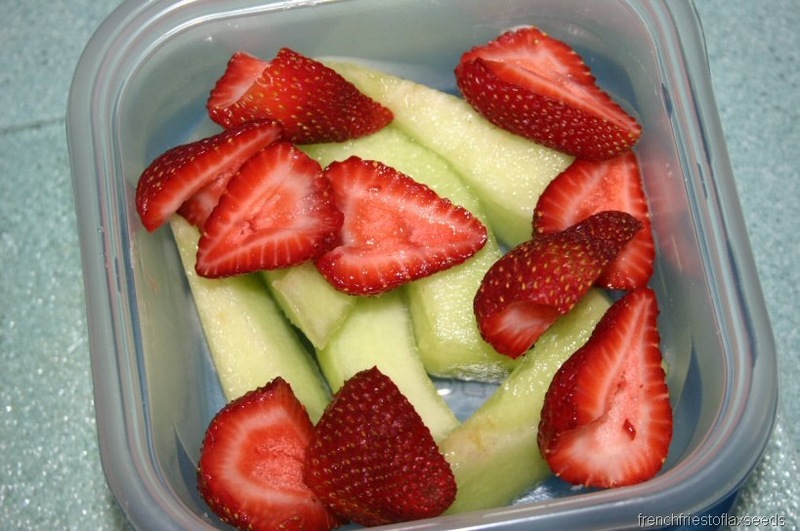 I brought one of my favourite fruit combos – honeydew and strawberries. I love the colours. 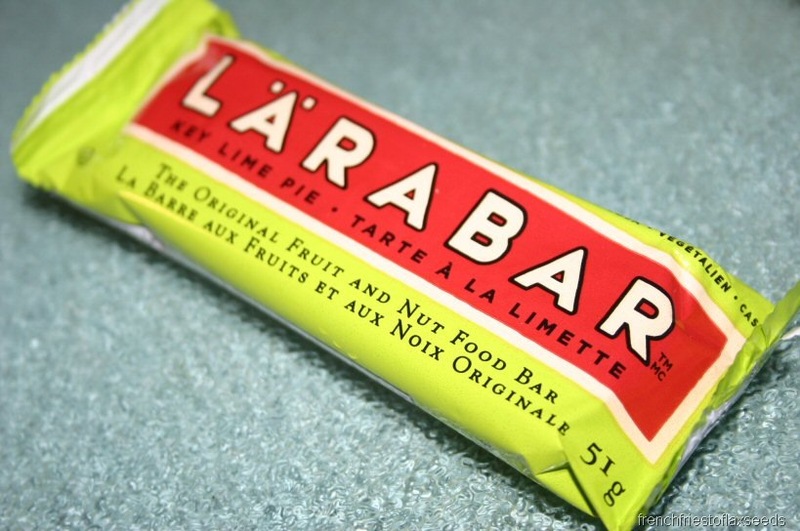 A Key Lime Pie Larabar. And of course, a little bit of dipping sauce for those fancy rolls. Perfect. Lunch seems a little light today, but it was kind of on purpose – I’m going out to dinner tonight to a little Italian restaurant that is literally half a block from my house. Can you believe I’ve never been there, and I’ve lived here for 4 years? Crazy, I know. I’m excited – they feature lots of locally grown products. I’m taking my friend for a belated birthday dinner. It should be fun. Hopefully we can sit on the patio and enjoy the lovely evening. I think I’m even going to take my camera. Woo! Gotta go make myself pudry! I saw that juice at the store the other day and thought of you!!! Your rolling skills are fabulous! I love the rolls! It’s so cool how you can see all the ingredients inside. They look fabulous! I’m finding your posts quite helpful for my chem class–we’re talking about temperature conversions, so when you mention Celcius, I have to convert it into Fahrenheit…OK dork comment over. 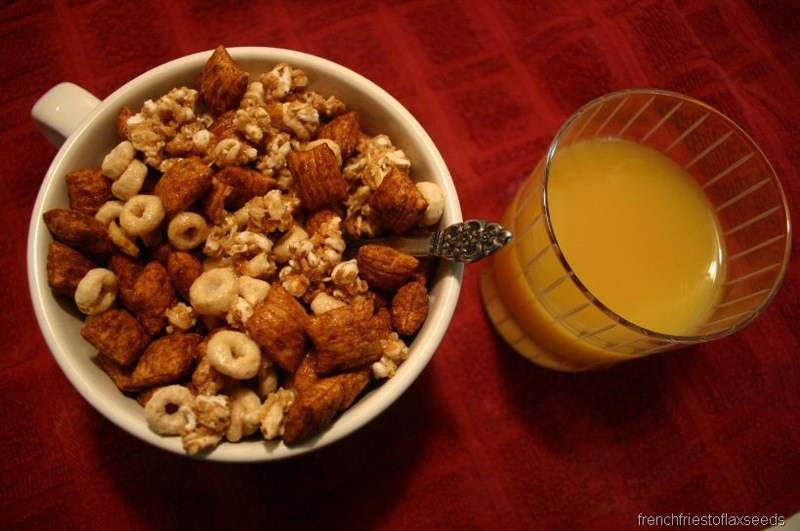 I love a giant overflowing bowl of cereal! Enjoy Italian restaurant!!!! 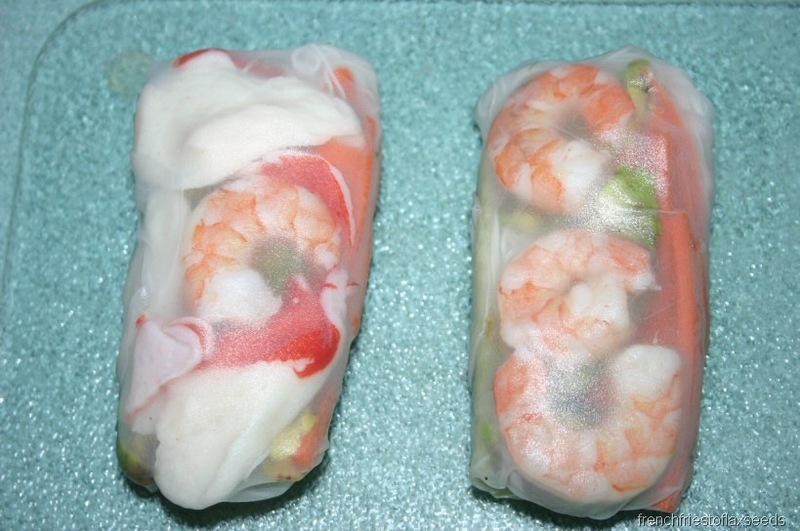 Oh and I am sure your shrimp rolls are delicious, but they are totally freaking me out! I’m in Comox Valley and this is so hot. Usually we have cooler temp, even in the summer. I’ve been eating sandwichs and salads. Too hot to cook. Honey dew and strawberries just epitomize summer! What a great fruit combo!! I love your lunch. It looks so amazingly fresh.